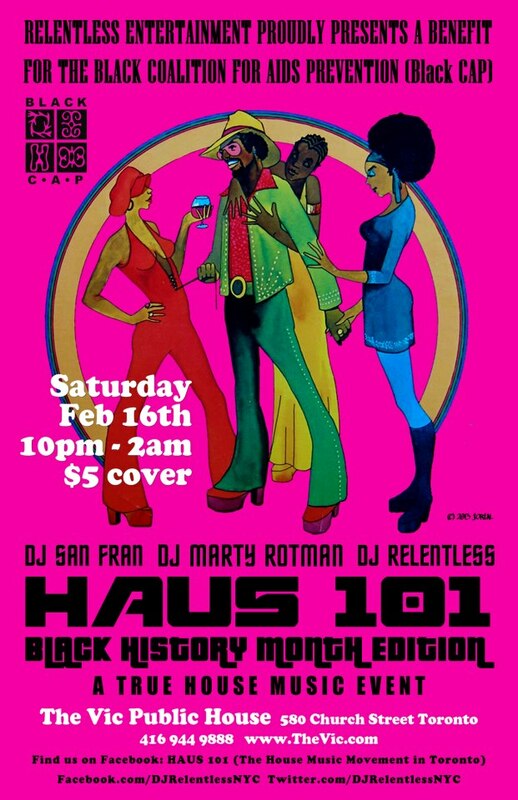 DJ SAN FRAN In The Mix: HAUS 101 - SATURDAY, FEB. 16, 2013 - Black History Month Edition! HAUS 101 - SATURDAY, FEB. 16, 2013 - Black History Month Edition! 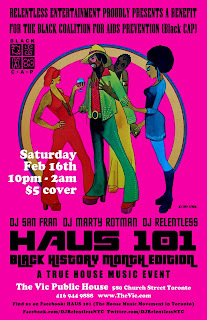 DJ San Fran, DJ Marty Rotman & DJ Relentless are back with their second HAUS 101 event, but at The Vic Public House (580 Church Street, Toronto) on February 16th. And since it's Black History Month, we are making this event a benefit for the Black Coalition for AIDS Prevention (BLACK-CAP). Three of Toronto's Underground House DJ's have come together to mastermind a new movement on the scene....HAUS 101! We believe that there should be a place to go to on Church Street for those who love real Soulful House, Deep Tracks and Disco that eventually birthed what we know as House Music today. We want to create a dancefloor where Loleatta Holloway, Robert Owens, First Choice, Roy Ayers, and Chaka Khan are still welcomed. A floor where Dennis Ferrer and Kerri Chandler could be mixed in without clearing the floor because it's not the Pop Commercial hits of the day. Where legends like Frankie Knuckles, Larry Levan and Mr. Fingers produced and mixed those tracks that inspired so many DJ's around the world. We want to hear the sounds that changed the history of music forever! So, if you think Deadmau5 or Tiesto is House Music....this is not the party for you! CALLING ALL HOUSE HEADZ! LET'S BRING HOUSE MUSIC BACK TO CHURCH STREET! The dance floor opens at 10 PM. $5 Cover.